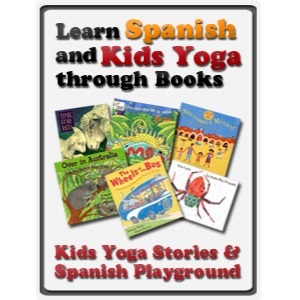 Welcome to the fifth post in our monthly series co-hosted by Spanish Playground: Learn Spanish and Kids Yoga through Books. 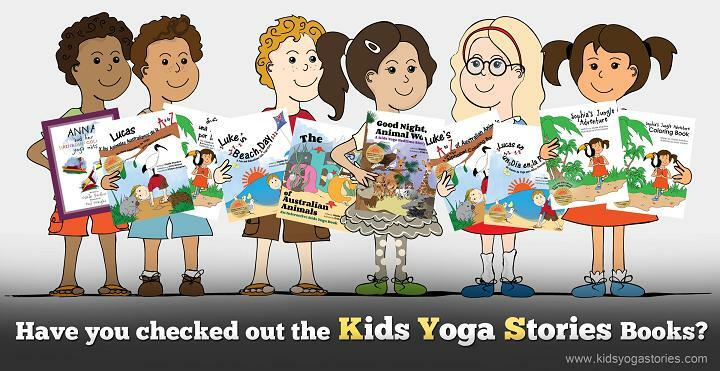 The Kids Yoga Stories blog features a book on a particular theme along with matching yoga sequences. On the Spanish Playground site, you’ll find other fun, creative activities to go along with the book. This month’s theme is AFRICAN ANIMALS. In our next yoga story, we visit Africa! This counting Safari book titled 123 African Safari is currently in production and should be available in the next few months. I thoroughly enjoyed researching Africa to write this yoga book. I’ve always dreamed of visiting this magnificent continent. I hope to take my family on a Tanzanian Safari trip one day. Until then, we can read books and act out the African animals through yoga poses for kids. 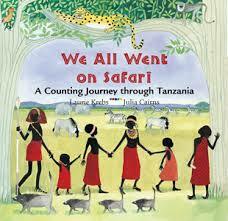 After I finished writing the Africa safari yoga book, I found We All Went on Safari by Laurie Krebs (published by Barefoot Books) at our local secondhand bookshop. I love the rhyming text and delightful painted illustrations. This book is also available in Spanish. 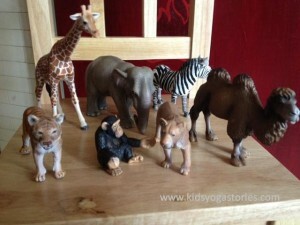 Below, you’ll find six African animals paired up with a yoga pose and a brief description. 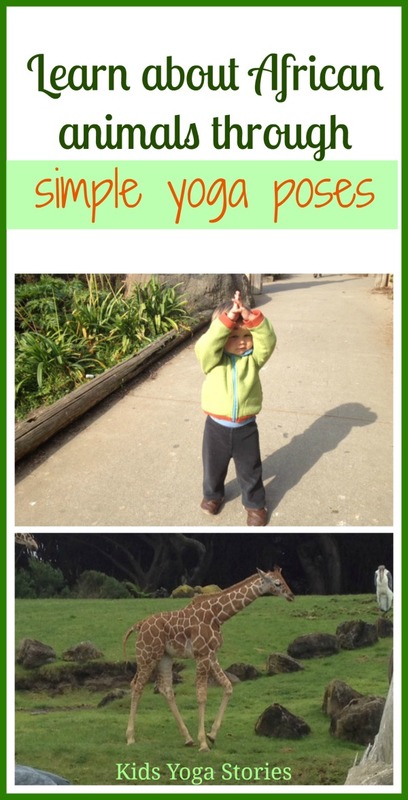 Ask your children to invent yoga poses to go along with the other four animals in the book. If they can think of other African animals that aren’t in the book, have them create poses for those, too! Encourage their creativity and movement without focusing on perfectly aligned poses. Bring out your African animal figurines, stuffed animals, puzzles, or anything else that will get you in the mood. Enjoy your African adventure! (Stand tall in Mountain Pose, look up, and reach your arms up to the sky, bringing the palm of your hands together. (Stand tall in Mountain Pose. Standing on your left leg, reach your right leg out behind you, place the outside of your right foot into your right hand, bend your torso forward with your left arm out in front for balance, and arch your leg up behind you. 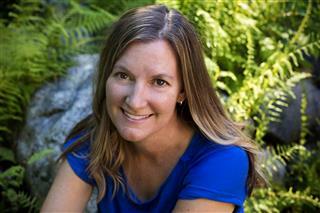 See the Kids Yoga Poses page for images and descriptions. Our daughter doing the Giraffe Pose while visiting the zoo. 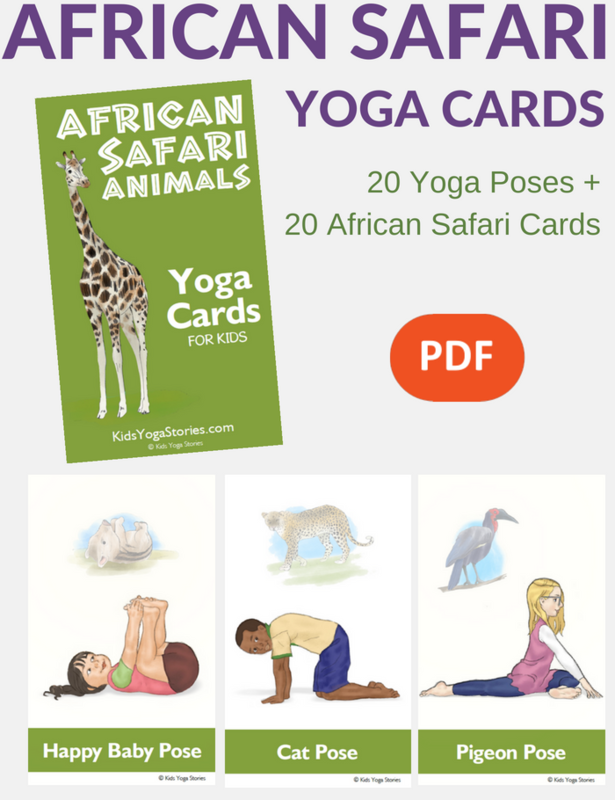 Purchase African Safari Yoga Cards for Kids here. 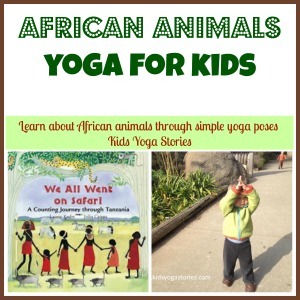 We hope that you enjoyed these African Animals yoga poses. To find out about other thematic yoga sequences, join our weekly Kids Yoga Stories newsletter by adding your name and email to the box at the top of the page. Visit Spanish Playground for language activities to go with Nos fuimos todos de safari by Laurie Krebs and Julia Cairns. Activities include rhyming words, counting items, predicting the story, and illustration study. The suggested activities could be done in English, as well. What a wonderful “African” resource, Giselle! I must love barefoot books. I have to read this book. Pinning! Thank you, Lisa! We All Went on Safari is a great book. I love Laurie Kreb’s writing. Thank you for your African folktale book link too. I’m excited for your African book to come out! Thanks for sharing this at Booknificent Thursday! Hope to see you again this week! I teach children’s Afro and Spanish yoga! I love these resources! !